What’s the difference between waking up every day and looking forward to going into work versus feeling like you are about to walk the green mile? Many of us who work in healthcare love the unpredictability of our industry – the life and death situations we face, the mystery diagnoses, and the unique and profound connections we make with other human beings who start out as strangers to us, but whose face and story will forever be branded in our memories. Yet despite the same experiences, why do some of us dread going into work? People who love coming into work, despite knowing how challenging their jobs are, work with a great, cohesive team. It’s the TEAM that makes all the difference. 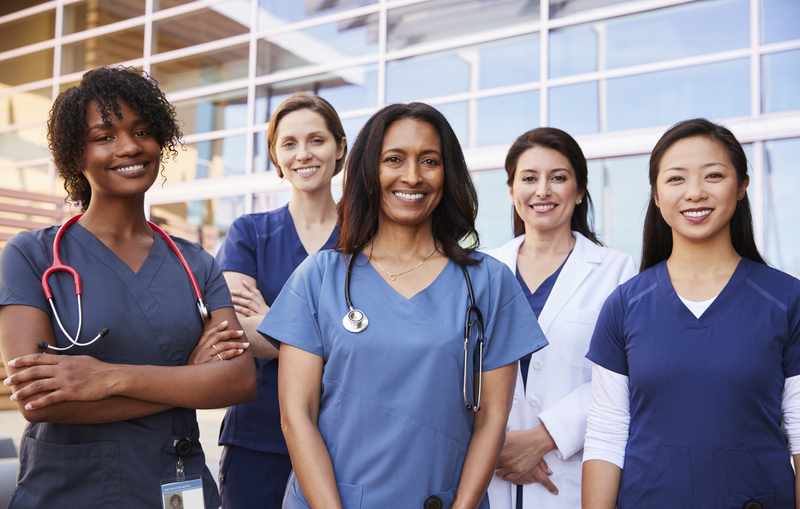 While building a cohesive team is crucial to any business, in nursing – I believe it’s mission critical. When working with a cohesive team, admissions, discharges, pain management issues, and patients prone to falls aren’t just divided up among the nurses on that shift. There is a shared responsibility and mindset built among cohesive teams. While each nurse still has their individual assignments, working collaboratively to meet the goals of the unit always comes first. Working as a team doesn’t only benefit you and your coworkers. It also elevates the level of care you provide to your patients. This in-turn improves patient satisfaction and facility benchmarks or goals. The complexity of healthcare today continues to increase. Nurses must rise to the challenge of caring for sicker patients by embracing a multidisciplinary approach. To do this, we not only have to function in teams, but we have to create successful teams, which takes strategy, hard work, and these four characteristics. Creating a shared vision is the driving force behind every great team. How do you create a shared vision? It first starts with the leader who understands the importance of identifying and communicating a common goal among the team. The leader asks the team, “Why do we exist? What is our purpose in this space?” And then involves everyone on the team in creating the shared vision in their department. In his book, The Fifth Discipline, Peter Senge calls this “alignment.” It’s when everyone is making decisions based on one shared vision, or common goal. Teams who establish alignment accomplish way more than teams who don’t. When asked, every person on a high functioning, cohesive team can tell you what the mission/purpose is. Imagine a team that never speaks to one another, communicates indirectly with each other, and avoids tough conversations. Everyone keeps to themselves and doesn’t share a mission, vision, or common goal. Before long, team members become distrustful and disengaged. However, if you add in open and honest communication, this team would start to build trust and engagement. Empowerment – Nurse Elyse is a competent new grad that lacks confidence. How can you empower her? Let her know that she’s doing a great job. Whether you use verbal affirmations or a hand-written note, take the time to acknowledge her for a job well done and watch her start to align with the shared vision of the department. Empathy – John made two medication errors in the same week. He sits down to lunch with you and a few other co-workers and says, “I’ve got to be the worse nurse in the hospital.” How do you should him empathy? Share stories about mistakes you’ve made in the past and watch him start to remember the goal of his care and why he became a nurse. Encouragement – Jillian and Ryan started on the same day. Jillian is prospering and has found a group of other nurses who provide a good bit of support. Ryan seems to be struggling to find his place on the unit. How can you offer encouragement? Stop Ryan in the hall and let him know he isn’t alone and that he can stop in your office anytime. Finding a team identity takes time. It requires each person to focus more on the team than on themselves. Like a pinky finger on a hand, by itself, not very strong but when joined with the other 3 fingers and a thumb, forms a powerful fist. Having clear descriptions for each team member and how their role adds value to the team helps everyone know what their job is toward meeting the shared vision and functioning successfully. Setting clear expectations also takes the guesswork out of finding your place on the team. Let everyone know what behaviors won’t be tolerated and hold people accountable. Remember that you don’t want to lose the personalities of individuals for them to feel like they have a place on the team (pinky’s are just as important as the thumb). Encourage people to be themselves and fulfill their roles in their own way. Give individuals the ability to create their way of doing tasks while still meeting the overall expectation. Did you know that being part of something bigger than yourself actually helps you feel stronger alone, too? It’s true, and science has even proven that the portion of our brain that’s stimulated when we talk about ourselves is also activated when we feel like we belong. This is the power of teamwork at its best. When you add in the sense of mutual accountability, your team’s cohesiveness will sky-rocket. Mutual accountability happens when everyone on the team feels a responsibility to the group as a whole rather than to oneself. It relies on trust and partnership that’s built around shared goals and promotes a culture of growth. When everyone feels mutual accountability, they don’t fear making mistakes, because they know a supportive team will back them from top to the bottom. It’s critical to remember that mutual accountability isn’t a “get out of jail free” card when team members make mistakes. It’s merely an understanding that mistakes will be met with an attitude of learning and acceptance. If you want to increase mutual accountability on your team, try gathering everyone together for 10-15 minutes weekly for an “oops!” meeting. Give each person a chance to talk about a situation or incident that occurred and what they should do differently next time. Point out opportunities where processes can be changed to keep these situations from happening again. By giving everyone a voice, you empower others to make some of the process improvements and create positive changes on the unit. Great teams aren’t magically engineered. They are cultivated, nurtured, and grown over time. The best news in all of this is that any group (and, I do mean any) can become a high performing, supportive, cohesive team when consistently watered and fed by the leader and each other. I don’t know about you, but I’d much rather wake up in the morning excited about going into work than trying to choose my last meal. I love hearing from you. Leave me a comment below to share your experiences with developing a cohesive team.